1. Delay and decay: It is based on the fact that radionuclides lose their radioactivity through decay, and this fact maybe utilized in the treatment not only of intermediate and high level solid, liquid and gaseous wastes but in some cases also in that of low level wastes. The aim is to ease problems in subsequent handling or to lessen risks of releases to the environment, taking advantage of the decay of some radionuclides particularly those having short half-lives with the passage of time. The principle is especially useful for those installations where a substantial reduction in the activity level of a waste stream can be achieved by delaying discharge of effluents for a few days. 2. Dilute and disperse: The principle of dilution and dispersion is based on the assumption that the environment has a finite capacity for dilution of radionuclides to an innocuous level. The application of this principle requires an understanding of the behaviour of radioactive materials in the environment and of the ways in which the released radionuclides, particularly those that are considered to be critical, may lead later to the exposure of man. It is especially important to take into consideration environmental processes which may cause re-concentration of radionuclides. 3. Concentrate and contain: The principle of concentration and containment derives from the concept that the majority of the radioactivity generated in nuclear programs must be kept in isolation from the human environment. Since some radionuclides take a long time to decay to innocuous level, some wastes must be contained for extended period of time. A full-length lab coat. Full-length lab coat should be worn closed with sleeves rolled down. Disposable gloves. Long disposable gloves should be worn and the lab coat tucked into the gloves. Close-toed shoes. Sandals or other open-toed shoes should never be worn while working with radioactive materials. Safety glasses. Safety glasses should be worn for any radioisotope procedure especially where there is a potential for the build-up of pressure that could release a spray of material. A tape or a rubber band. It is for protecting the skin of the wrists by keeping the lab coat cuffs from hanging down or dragging across contaminated surfaces. Extra clothing. One should have an extra set of clothing and shoes in the lab in case his/her clothing becomes contaminated. Do not empty radioactive trash. 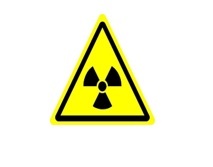 Do not use or service radioactive labeled equipment without authorization from radiation safety. Radioactive materials must be stored in lockable metal cabinets or refrigerators at designated locations in a laboratory. These areas should be labeled with the "Caution Radioactive Material" signs and should be protected against unauthorized access. Proper shielding should be arranged to prevent emission or spillage of radioactive materials. Once opened, all vials containing unbound sources, example; radioiodine, should not be stored in refrigerators but in fume hoods and should be tightly sealed. 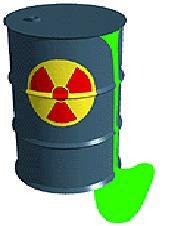 All waste contaminated with radioisotopes must be disposed as radioactive waste. 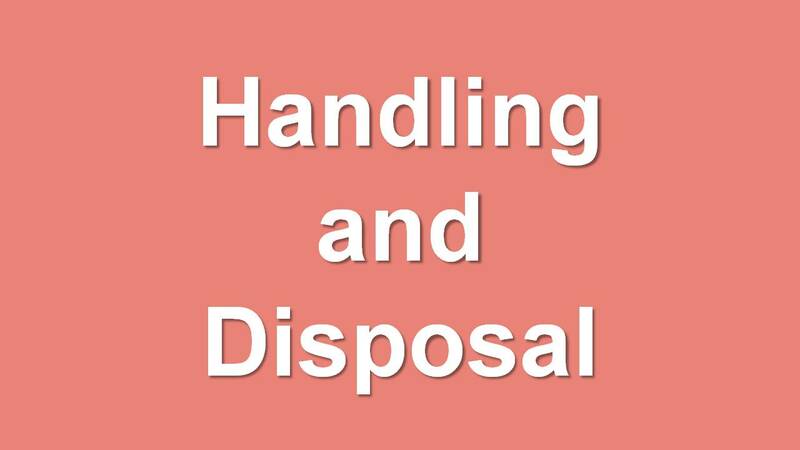 Solid waste should be packed in clear plastic bags and should not contain pourable liquids or animal carcasses. Needles, pipettes and other sharp objects should be placed in a puncture-proof sharps container. Some liquid waste can be diluted until their activities drop below acceptable levels, and then disposed as normal waste into the sewer system. For one to discharge any radioactive material, he must seek for permission from the radiation safety officer by providing estimated quantity to be discharged. 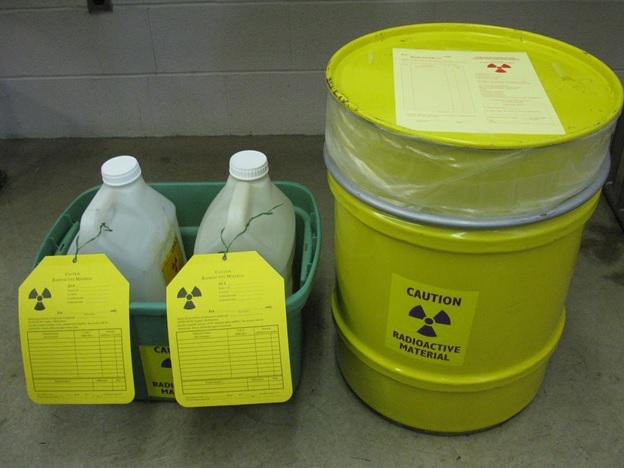 Some non-dischargeable radioactive materials might need to be stored or disposed by returning to the manufacturer or to the Radiation Board. 1. b) Short half-life radionuclides. 1. The Textbook of Radiological Safety, first edition, by Dr. k.Thayalan.